As our tastes change in our own photographic style, I've been wanting to take a look as some older images and re-edit them to how I would like them to look now. It's a great practice especially as your skills with post-processing improves. I think the original image, I mainly processed in ACR (eek!). Not only that, I remember spending several hours on that image. I've really learned to keep things simple. This edit took me 20 minutes while I waited for coffee to brew. 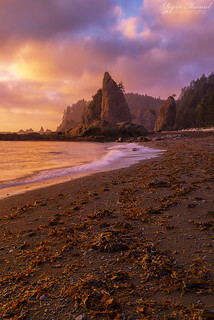 Titled Best Kelped Secret because out of countless visitors to Rialto Beach, only a few actually walk all the way here, 2 miles. Hope you are having a great weekend! Image - single exposure, Singh-Ray Gold-n-Blue filter.